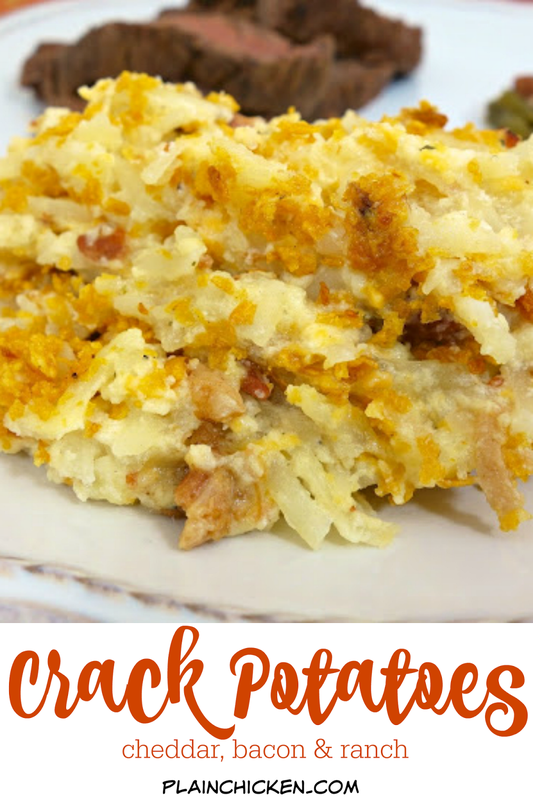 Crack Potatoes recipe - potato casserole made with Greek yogurt, cheddar, bacon & ranch! SO good. People go crazy over these! I take these to potlucks and there are never any left!! Can make ahead and freeze. 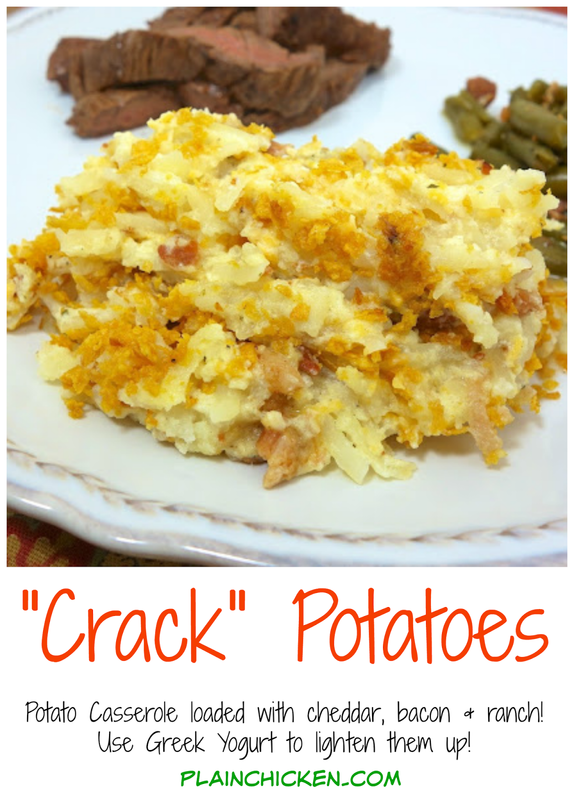 Crack Potatoes are one of the most popular recipes on the blog and at our house. Chicken Legs LOVES them. I had some Greek yogurt in the fridge, and I decided to make healthier another version of our favorite side dish. These turned out great! Chicken Legs didn't even know they had Greek yogurt in them! 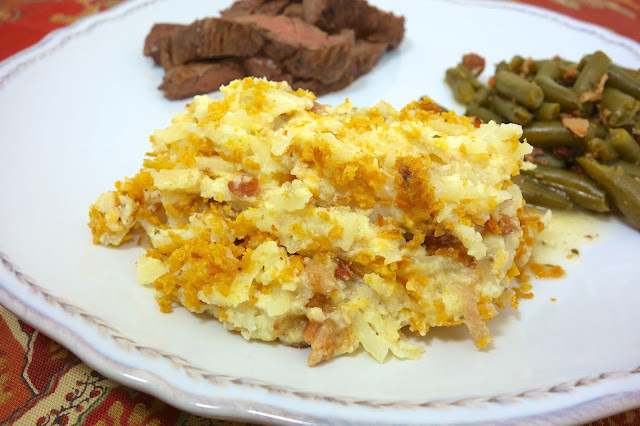 The potatoes were so creamy and packed full of great flavor. I've make these several times. I usually have a batch in the freezer ready to go at a moments notice! Give this version a try and let me know which one you like best. 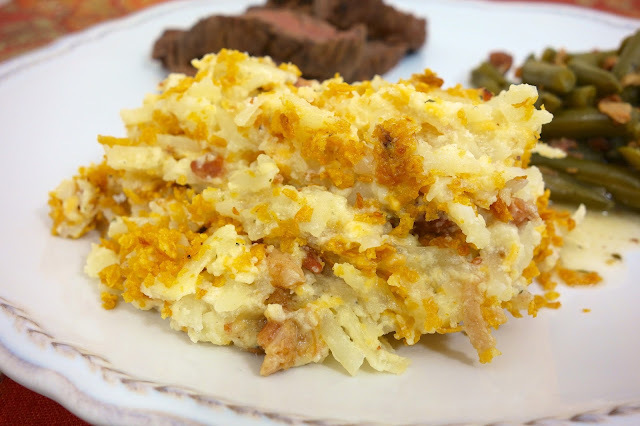 Mix together hash browns, soup, yogurt, cheese, Ranch mix, bacon and 5 Tablespoons melted butter. Spread into pan. Combine crushed cornflakes and 1/4 cup melted butter. Spread over potatoes. I use Greek yogurt as a substitute for sour cream in a lot of recipes, and it always turns out great. You really can't tell a difference in taste. I've even served Greek yogurt on baked potatoes in place of sour cream. I've also used Greek yogurt in place of sour cream when baking. The only major difference is the price! CaseyBama you are right about the price! I use Chobani for just about anything calling for mayo or sour cream. I even use it to make tuna or chicken salad. But favorite use is spreading a thin layer on a tortilla before adding the fish for Fish Taco's ~ top with all the fix'ns and another dollop before adding the salsa...yum! Yum! I sub greek yogurt for sour cream too. Or, sometimes cottage cheese. i don't have corn flakes, (kids r grown and live in Fl) . do you think crackers would work? I am thinking the butter kind. or maybe the ones that are flavored ? I use Kellogg's brand Corn Flake Crumbs. I find them in the baking aisle (at least at my grocery store).